Fragrant branches of eucalyptus bundled together to form swags of various lengths. What size do you need? We can work out the details via e-mail. 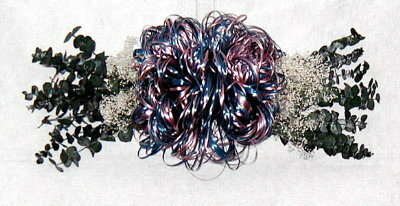 Small bunches of preserved mini baby's breath are nestled on each side of the unique ribbon bow. Bows are available in a wide array of colors, or combinations of colors. Let me know what colors you would like in the extra info box on the order form. Other sizes and prices available: please email for details. 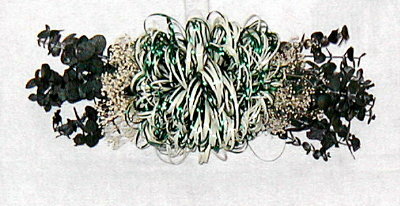 12" in length, this swag is shown with a combo bow of Hunter Green and Ivory. This 14" swag is shown with a Hnter Green bow. This one is 16" in length with a combo bow of Country Blue and Mauve. 18" in length with a Teal bow.